Just like other bedroom essentials; the bedroom vanities also enhance your room’s beauty and give you storage for your make up and other items. There are many contemporary bedroom vanities with different colors and up-to-date styles. 8. Vanity Set with Mirror by Williams Import Co. Enhance the beauty of your bedroom décor with this lovely Unfinished Vanity with Mirror by International Concepts. Crafted from parawood, this sturdy vanity set has a butcher block surface. This beautiful vanity set is ready to finish. You can varnish it with the matching color of your bedroom theme. There are six compartments under top mirror for jewelry storage. You can store your earrings, bracelets, trinkets and other knick-knacks in separate compartments. The two felt lined drawers are spacious and provide ample storage space for vanity items. This International Concepts Unfinished Vanity with Mirror will be a smart addition to any bedroom. It is ready to finish. Includes a flip top mirror. Has a butcher block surface. Drawers operate smoothly on Euro glides. Storage box with six compartments for keeping cosmetics items and jewelry. Design of the handle: Matching colored knobs. Requires assembly and very easy to assemble. The gorgeous Mega Home Contemporary Vanity Set with Mirror will enhance the grace of your bedroom décor. Hardwood and hardwood veneers render sturdiness and durability to this Contemporary Vanity Set and make it long lasting. The stylish Contemporary Vanity Set includes a vanity with a mirror and bench. The vanity features one spacious drawer and table top which can easily accommodate all your jewelry and vanity items. Swivel mirror allows you to have a closer and better look of yourself. Bench is upholstered and padded generously with foam to provide you with exceptional comfort. Manufactured from hardwood and hardwood veneers. Also available in Espresso finish. Includes one swivel mirror and matching stool. Flip top mirror is beveled. One drawer for keeping your accessories. Design of the handle: Knob. Maximum weight capacity for the stool: 160 lbs. Add stylish flare to your bedroom décor with the stunning Bret Vanity Set with Mirror. Beautifully crafted from manufactured wood, this vanity set is durable and sturdy. 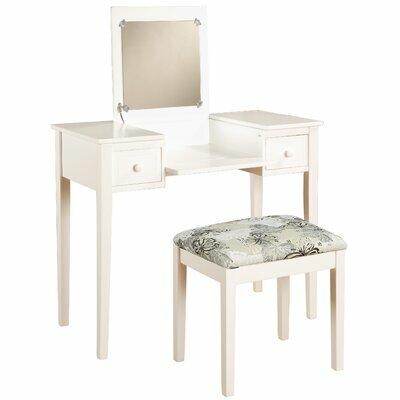 The Bret Vanity Set includes a vanity with flip top mirror and a butterfly bench. The flip top mirror saves space and when folded gives you additional table space. Tapered legs and round knobs add boldness to its overall look. It is also available in black finish accentuated with antique silver knobs. Bret Vanity Set with Mirror Collection. Constructed from MDF and rubber wood. Also available in Black finish with antique silver knobs. Includes mirror and butterfly bench. Mirror has safety stay hinges. Plush and lusciously padded bench. Two drawers for keeping your jewelry and make up items. Comes with pre-drilled wire management hole for hair dryer. Design of the handle: Knobs in matching color. Maximum weight capacity for vanity table: 15 lbs. Maximum weight capacity for stool: 250 lbs. Crisp white finish with classic drawer pull and gracefully turned legs make this vanity set an excellent choice for any lady who loves to primp up in style. Crafted from robust blend of Vietnamese mahogany wood and engineered wood, this vanity set ensures sturdiness and long lasting endurance. One drawer accented with classic gold-brushed drawer pull gives ample storage space with classy finishing touch. Gracefully turned legs add boldness to its overall look. Triple panel mirror allows you to view yourself from different angles while you rest on comfy bench that is upholstered and padded with foam. Made from Vietnamese mahogany wood and engineered wood. Three panel mirror and matching stool included. Bench color: Matching base with beige colored upholstery. Design of legs: Turned legs. Includes one drawer for storage. Design of the handle: Drawer pull in brushed black finish. Maximum weight capacity of the bench: 250 lbs. Primp up yourself in style with this stunning Wildon Home ® Teresa Wall Mount Vanity with Mirror. It is a compact and space-saving wall mounted vanity ledge. Its unique design offers ample storage space for your vanity essentials. There are holsters for hairdryer that make organizing your beauty gadgets a piece of cake. 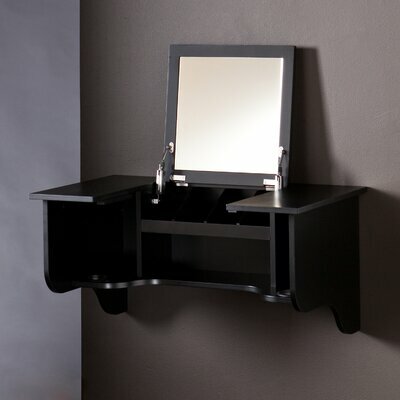 The sturdy wall-mount system with flip top mirror and bold black finish make this vanity a great and stylish choice for your bedroom, bathroom or dressing area. Teresa Wall Mount Vanity set Collection. Mirror when folded down adds to table top space. 3 metal wall mounting cleats make installation simple and durable. Wall mounting vanity allows you to position it according to custom height. Maximum weight capacity of the top: 35 lbs. Maximum weight capacity of each compartment: 8 lbs. Manufacturer provides 1 year limited product warranty. Create a stunning focal point in your bedroom with this gorgeous Zipcode Design Lyndsey Vanity Set with Mirror. Metal construction makes this vanity set robust and long lasting. It features a vanity with a vertical mirror and a bench. It comes in black/silver finish that gives it a great look. The swivel mirror is functional as it gives you better view at different angles. The finished top and the shelf below it provide ample storage space for keeping you jewelry boxes and vanity essentials. Vanity Set with Mirror Collection. Crafted from stainless steel and MDF. It has finished top with metal base. This lovely vanity set is also available in Cappuccino/Silver and Cappuccino Marble/Bronze finish. Includes standing mirror and matching stool. Vertical swivel mirror has silver finish. Mirror is adjustable and can also be removed when necessary. Storage shelf below the table top. Graceful straight legs for bold look. Seat color: Black upholstery with matching metal base. Stool is padded with foam and has microfiber upholstery. Maximum weight limit of the bench: 185 lbs. The aesthetically appealing Olympic Vanity Set with Mirror will be an excellent addition to your bedroom. This vanity set is manufactured from sturdy metal that renders its strength and long lasting durability. The set features a vanity, a standing mirror and a matching bench. Its nickel bronze finish and glass components add stylish flare to its overall charm. It has glass top and shelf to accommodate your entire jewelry box and other vanity essentials. The matching seat is very comfortable so that you can primp up yourself in a relax mood. This Olympic Vanity Set is adorned with leaf inspired motifs that will give a classy touch of elegance to your room. Constructed from sturdy metal and glass sheets are used as table top and shelf. 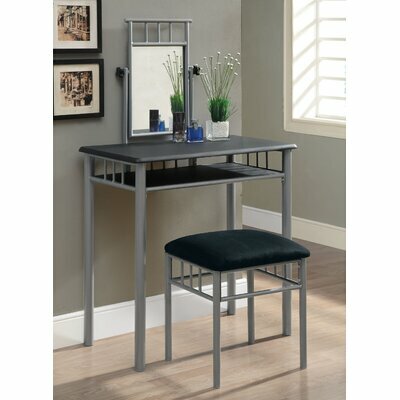 Vanity set includes a table with mirror and matching stool. Beautifully designed and adorned with leafy motifs. Standing mirror with leafy adornment on the top. Padded seat with soft neutral fabric upholstery. Spacious glass shelf below the table top for keeping your jewelry boxes or make-up. Maximum weight capacity of the bench: 200 lbs. 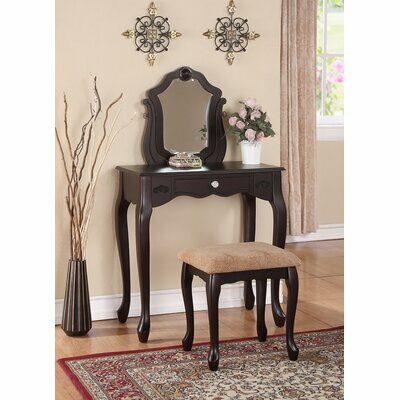 Bring style to your home with this elegant Williams Import Co. Vanity Set with Mirror. Crafted from sturdy manufactured wood, this vanity set is robust and long-lasting. It comes in charming espresso finish that blends beautifully with an array of decors. 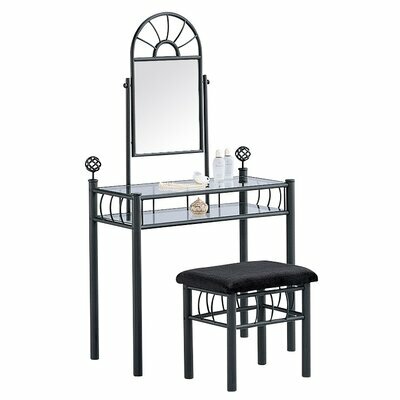 The Williams Import Co. Vanity Set features a vanity table, mirror and a matching stool. Vanity table has one felt lined drawer and spacious top where you can keep all your jewelry items, make-up kits, brushes and other beauty accessories. The upholstered stool is lusciously padded with foam for optimal comfort. It has swivel mirror for better view at multiple angles. Its mirror is unique with a beautiful lotus inspired design. This gorgeous vanity set with its uniquely designed mirror will add sophistication to your bedroom. Set has one standing mirror and matching stool. Mirror has a unique and classy design. Design of legs: Beautifully turned legs. One felt lined drawer for keeping your accessories safe and organized. Design of the handle: Metal knob. Maximum weight capacity of vanity table: 150 lbs. Maximum weight capacity of bench: 200 lbs. Tools required for assembly and installation: Phillips screwdriver. The charming design of Hazelwood Home Vanity Set with Mirror will bring a stylish flare to your room. Sturdy metal construction gives strength and durability to its structure that makes it long lasting. Its bold black finish blends beautifully with most of the bedroom themes. 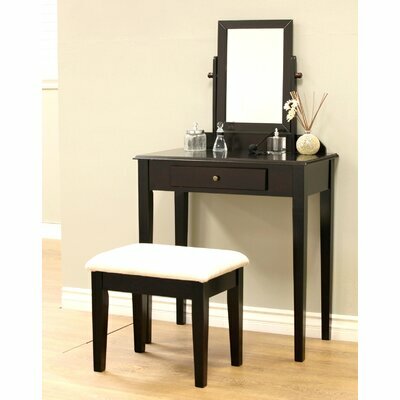 This contemporary vanity set features a vanity table with a matching bench and a standing mirror. Upholstered bench is padded generously with foam for optimal comfort. The Hazelwood Home Vanity Set will prove to be an ideal addition to any lady’s room. It will be perfect for bedrooms with contemporary décor. 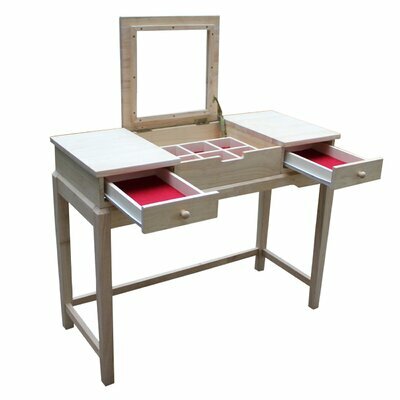 Vanity set includes a table, standing mirror and matching stool. Metal base is topped with glass. Spacious glass shelf offer ample space for keeping your vanity essentials. Upholstered stool is lusciously padded with foam for optimum comfort. Requires assembly and easy to put together. Maximum weight limit of the bench: 200 lbs. 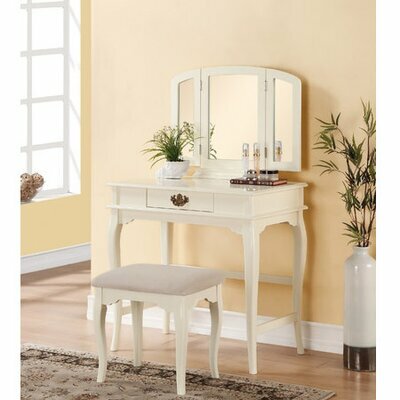 The attractive Wildon Home ® Bullhead City Vanity Set with Mirror will glamorize your bedroom by adding subtle charm to it. 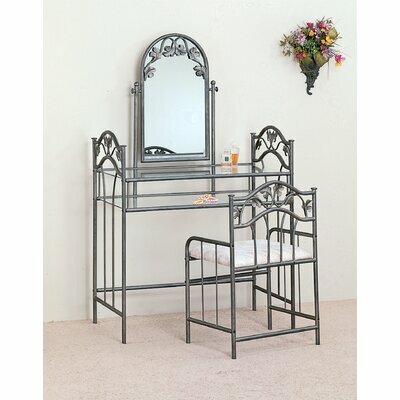 This vanity set is constructed from metal for long lasting sturdiness and durability. It features a graceful black finish that blends beautifully with most of the room decors. The metal base is topped with glass which can be used to keep your vanity items and other beauty accessories. The glass shelf below the table top provides additional space for storing your perfumes, make up kits and other knick-knacks. Metal tubing and swirly heart motifs adorn the vanity table that gives a pretty touch to its overall look. The crown of the mirror and matching bench are also accentuated with the swirly heart motifs. Comfortable bench is padded generously and upholstered in luxurious black fabric for perfect matching look. Bullhead City Vanity Set Collection. Heart motif on table, mirror and bench. 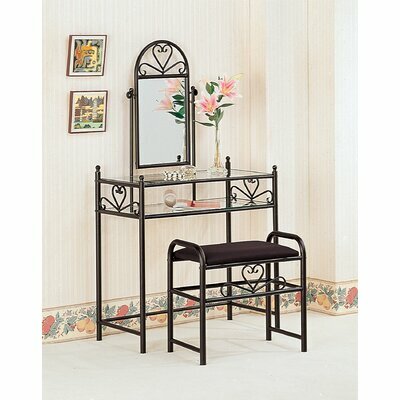 Set includes vanity table, a standing mirror and matching bench. Glass top and one glass shelf provides ample space for vanity essentials and other items. Bench is generously padded with foam for optimum comfort.